Private bus companies in Bangkok went on strike recently to ask for the government's help to ease the impact of soaring fuel prices following the Central Administrative Court's injunction against bus fare hikes. 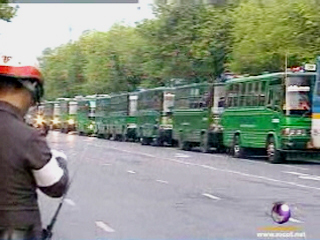 Bus drivers parked about 200 buses at and near the entrance of the Ministry of Transport on Bangkok's Ratchadamdeon Nok Avenue. Thousands of low-income commuters were without bus services on some routes and much-reduced service on others. Private Bus Operators' Association president Chatchai Chaiwiset urged passengers to understand the move, as the private bus companies could not operate their services any longer because of skyrocketing diesel fuel prices.